Courtesy of Marvel Comics, here's an exclusive sneak peek at the cover of Secret Avengers #21.1. In this issue, author Rick Remender corrals a new team of covert-ops superheroes. See Machine Man use his head (literally) in this exclusive art preview of Marvel&apos;s Hulk! Next year, critically acclaimed creators Rick Remender (Uncanny X-Force) & Gabriel Hardman (Hulk) take readers deep under cover in Secret Avengers! 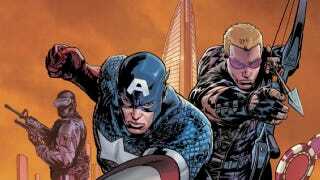 Captain America has tasked Hawkeye with putting together a brand new team, ushering in a new era for the Secret Avengers. When the call is put out for heroes to save the Marvel Universe from its most dangerous foes, the biggest powerhouses will answer. America's Secret Soldier – Venom, The UK's premiere super hero – Captain Britain, Founding Avenger – Giant-Man and more will join ranks to create a team that will have fans everywhere demanding more. Packed to the brim with action, intrigue, insurmountable odds AND covers by legendary artist Arthur Adams, no fan can miss this! "Our opening arc will have a big secret war, a big secret new world, a big secret new race, a big team death, a big secret team betrayal, and begin a secret affair. High stakes, intrigue, and tons of character drama as we unearth the mystery surrounding familiar automaton villains reimagined as members of a new species—The Descendants!" exclaimed Remender. "I'm a tremendous fan of Gabe's work; he's one of the best storytellers in the business, always puts clarity first, while still managing engaging and dynamic action. I'm beyond excited to have him joining me on Secret Avengers. And having Art Adams on covers is truly a dream come true." Kicking off this January in Secret Avengers #21.1 by Remender and red-hot artist Patrick Zircher, fans can get a taste of what we've got planned before Gabriel Hardman jumps on board as the ongoing artist with Secret Avengers #22. "Secret Avengers gives me the opportunity to draw an exciting group of heroes who I've never drawn before as well as design new villains and new worlds. Hawkeye, Beast and Valkyrie have been favorites of mine since I was a kid. That combined that with the crazy big, black ops tinged action/adventure makes this a book I had to draw," explained Hardman. "Rick is known for his wildly inventive scripts and he really delivers with Secret Avengers. This is an epic story that will have big repercussions. That's the kind of storytelling I like to be involved with." With Hawkeye at the helm, Captain America's strike force team must dodge Adaptoids, Descendants and the biggest threats to the Marvel Universe…without anyone knowing, in Secret Avengers!